Check out our new & improved birthday party packages! We guarantee your child will have a BLAST! Click here: Make an account with us to get a birthday party set up! 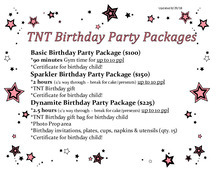 Please print & fill out a TNT Gymnastics birthday party waiver for each member of the birthday party. 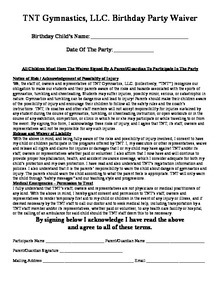 Download "Birthday Party Waiver 2018.pdf"